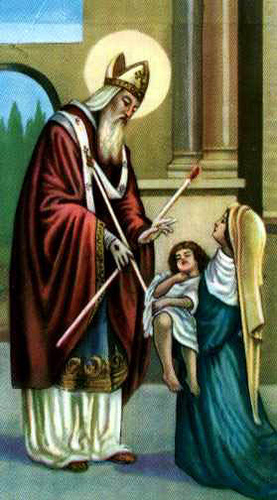 February 3rd is the feastday of St Blaise, the patron saint of throat illnesses. Saint Blaise's protection of those with throat troubles apparently comes from a legend that a boy was brought to him who had a fishbone stuck in his throat. The boy was about to die when Saint Blaise healed him. Very few facts are known about Saint Blaise. We believe he was a bishop of Sebastea in Armenia who was martyred under the reign of Licinius in the early fourth century. The legend of his life that sprang up in the eighth century tell us that he was born in to a rich and noble family who raised him as a Christian. After becoming a bishop, a new persecution of Christians began. He received a message from God to go into the hills to escape persecution. Men hunting in the mountains discovered a cave surrounded by wild animals who were sick. Among them Blaise walked unafraid, curing them of their illnesses. Recognizing Blaise as a bishop, they captured him to take him back for trial. On the way back, he talked a wolf into releasing a pig that belonged to a poor woman. When Blaise was sentenced to be starved to death, the woman, in gratitude, sneaked into the prison with food and candles. Finally Blaise was killed by the governor. Blaise is the patron saint of wild animals because of his care for them and of those with throat maladies. Take time as Saint Blaise did to find out how you can help wild animals. Find out what is being done to support and protect the wildlife in your area. There is wildlife everywhere, even in cities. Even a birdfeeder can help God's creatures survive.